Publications in both film criticism and academic film studies have historically been in writing, but as affordable lightweight cameras and digital film-editing tools increasingly have put video production into the hands of anyone, that has been changing. Particularly during the last decade, the audio-visual film essay — film criticism with moving images — has gained traction as an alternative to the written film essay. It has become a quite common form of commentary or reflection on feature films, television programming, and other moving-image works. Among developments that have driven its emergence has been the popularity of fan-created video testimonials to favorite films and television shows. Audio-visual essays take a variety of forms, but regardless of which variant is deployed, the goal of the emerging nonfiction device is to use visual means to reveal, analyze, and even discover striking aspects of moving-image form and technique. 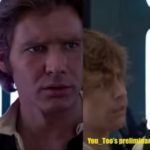 It has shown, for example, that particular filmmakers have characteristic ways of framing images, or use certain visual motifs in particular films. Typically the essays make their points by using excerpts of existing works. But the approach is still taking shape, so authors have a great deal of freedom to decide how to proceed. Reflecting this fluidity, the audiovisual essay goes by a variety of largely interchangeable names whose definitions and differentiations are not yet fixed: the video essay, the videographic essay, the essay video, the visual essay, the scholarly video, the moving-image essay, the cinematic essay… (For that matter, there is no agreement on the form’s historical origin). 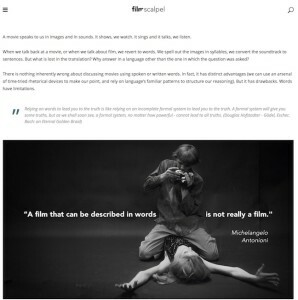 Video essays have become possible as a variety of technological developments have occurred, as Julia Vassilieva, a specialist in film and screen studies at Monash University in Australia, has explained. 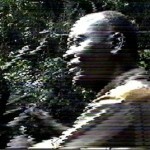 In the 1970s, frame-by-frame analysis was able to demonstrate fine points of film craft, for example, “nuances of facial expression, degrees of movement, or interplay of light and shadow.” VHS tapes and then DVDs made films accessible to more potential commentators, and also sparked the creation of such added features as commentaries, featurettes, out-takes, and the issuing of various “cuts” of a film, particularly the ones that directors wanted the public to see before studio executives got out their scalpels. 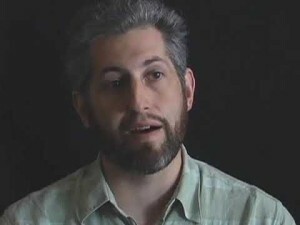 If most video essays run from just a few to several minutes, that probably reflects the likeliest limits, for now, of many potential audience members’ span of ready attention to them; but feature-length examples exist that have received considerable acclaim – for example, Ross Lipman’s experimental, 130-minute “kino-essay,” notfilm. It pores over Samuel Beckett’s only feature film which depicts a sort of notstar played by aging silent-film icon Buster Keaton. Lipman’s is a quasi- or extended documentary film. But even the simplest, or shortest, of manipulations of film footage can effectively demonstrate aspects of film craft. The contributors to the site, Silent Movie Gifs, for example, often do little more than create GIFs of short segments of silent films, which reveal aspects of montage, thematic development, or other film devices. Given the form’s infancy, the field is open for “surprising, inventive, and boundary-breaking” contributions, as two seasoned practitioners, Cristina Álvarez López and Adrian Martin, say. Appealing approaches include non-verbal visual essays, which speak — perform — audiovisually as well as ‘essayistically,” as Catherine Grant puts it. 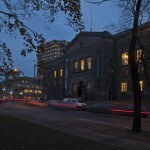 One of the most active figures in videographic essay making, Grant, a scholar of film and media studies at the University of Sussex, says effective video-essay forms, “arrived at tentatively, experimentally,” by mixing materials and media, may combine research and art, as she wrote in introducing a selection of audiovisual essays for a December 2016 issue of NECSUS European Journal of Media Studies. As part of their project of “theorizing” the video essay, even as it takes shape, or shapes, creators of video essays have addressed – sometimes in video essays — many of the potential drawbacks and challenges of the approach. “The Essay Film: Some Thoughts of Discontent,” which the prolific Kevin B. Lee prepared for the British Film Institute’s Sight & Sound Magazine, with an accompanying essay, constitutes a sort of video-essay manifesto for the video essay. 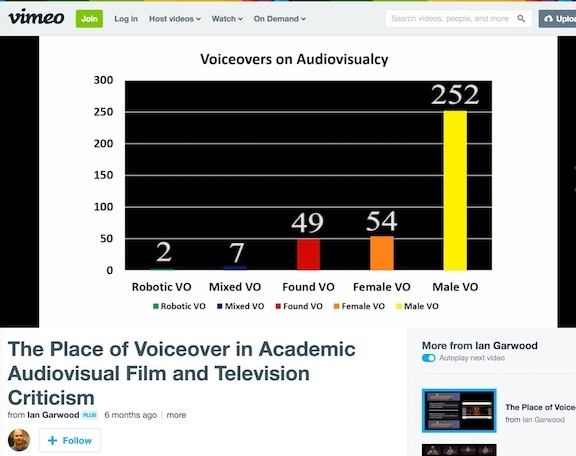 See, also, the 20-minute “The Place of Voiceover in Audiovisual Film and Television Criticism,” in which Ian Garwood, from the University of Glasgow, has some fun with the prevalence of male versus female voices in the emerging critical form. Academics who begin creating video essays often create works that resemble traditional written critical works, such as academic essays, conference presentations, or journalistic film comments and reviews that have long used photographs or other illustrations. 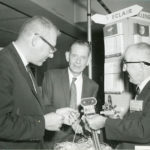 Even the least innovative video essayists, however, often fear that the work will not impress hiring, promotions, and tenure committees. Providing a credentialing mechanism was one of the key rationales for starting [in]Transition: Journal of Videographic Film and Moving Image Studies, says Jason Mittell, a film and media culture specialist at Middlebury College, in Vermont, and a project manager for the publication. He explains: “In the Internet era it’s not hard to get something published: it’s very easy to post something online. 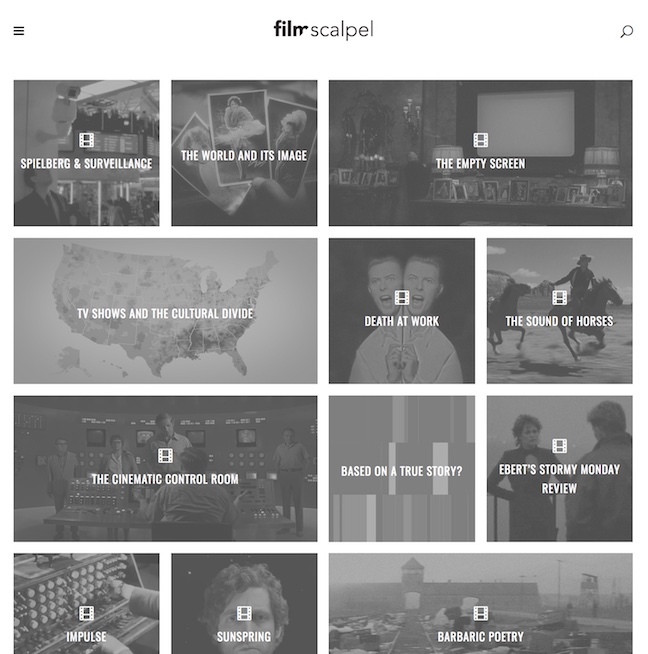 With Vimeo and YouTube, you can publish pretty much any video you’ve made, for free. That’s easy. The hard part is getting the right people to see it, and if you’re an academic, having it be regarded as more than a self-publication. By “performative,” she means that video essays can bring new thinking into being by being what they are — by “performing” new insights. At their best, video essays do that, even if that distinction between performative and qualitative is strained: plenty of qualitative scholarship “performs” — imagines, engages, expands — more than the works analysed. As theorizing about the video essay proceeds, one danger is that it will take typically academic recourse to prolix, Latinate language. Pioneers are busy formulating protocols, principles, and validation procedures for the form. As they press ahead, they admit to a degree of anxiety about the reception that video essays may get in traditional film studies. Grant concedes that film studies is less advanced in its use of and claims for the videographic essay than the creative arts, film, and design practice. He notes that, within the United States, at least, “most videographic criticism falls squarely under the provisions of fair use, allowing you to reuse copyrighted materials without permission, with some important exceptions.” For that, thank Section 107 of the U.S. Copyright Act, on “fair use,” which states that using a copyrighted work is permissible in commentary, criticism, news reporting, and educational uses. Mittell also notes, however, that “fair use is vague by design, requiring a judgment call (by a judge in court) as to whether [a particular use of copyrighted material] violates copyright law.” Copyright holders, particularly corporations rather than individual filmmakers, might challenge the fairness of a video-essaymaker’s use of material. In any case, he adds, copyright-owning film corporations have lately not often been eager to get into public quarrels over the extent of fair use: it’s bad publicity, and any battle they might lose in court might expand the accepted understanding of fair use. Still, in the not-too-distant past, conflicts between essayists and copyright holders did erupt – in 2009, YouTube took down Kevin B. Lee’s archive of video essays after Warner Brothers claimed that his use of snippets from Warner-owned films violated copyright. Essays by other videographers have met similar fates, including some that Nelson Carvajal, a Chicago filmmaker, posted on Vimeo only to see taken down in 2013 after objections by the Walt Disney Company. One had attracted nearly half a million views. 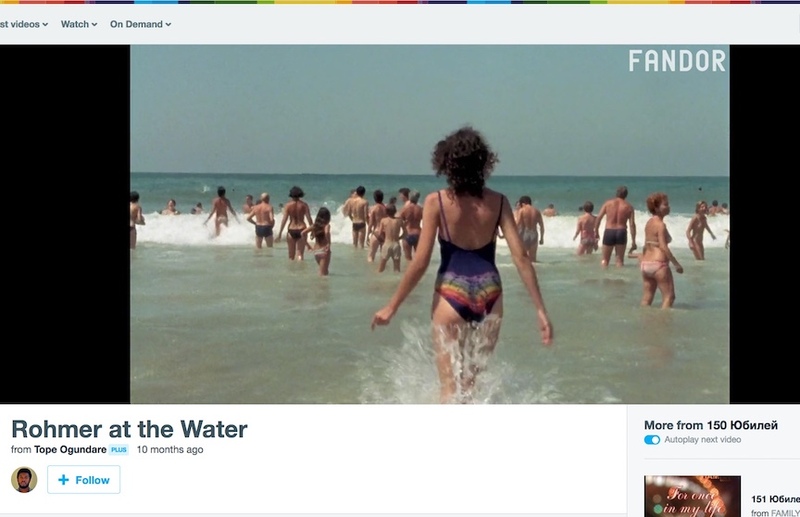 Fandor’s removal in 2017 of hundreds of video essays left them at sea, but Audiovisualcy’s Backdor, a Vimeo group, has returned many to availability. Embrace the frisson of lawlessness. Join the ranks of practitioners, and students progressing through the ranks towards academic positions. The advance of he video essay seems unlikely to die back, now. alsolikelife, the website of video essayist Kevin B. Lee. 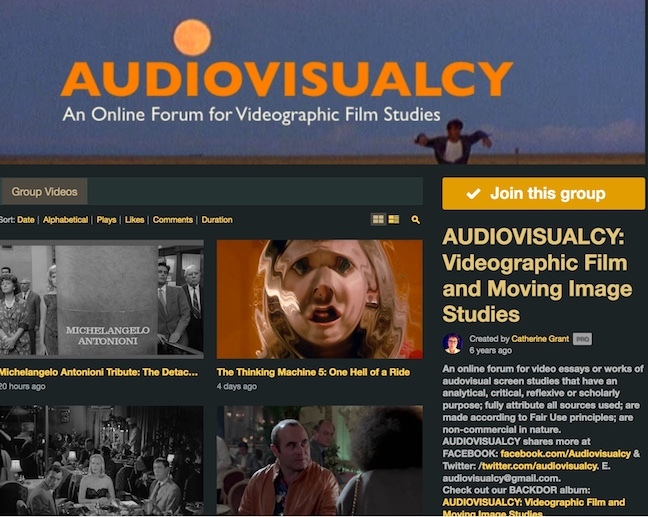 Audiovisualcy, an online forum for videographic film studies created by Catherine Grant. Criterion Collection, a film-reissue specialist, has a section of essays, features, clipping, news, etc., with many video essays. 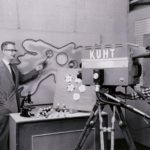 Critical Commons, a pioneering public media archive and fair-use advocacy network that supports the “transformative reuse” of media in scholarly and creative contexts. Every Frame a Painting, Tony Zhou and colleagues’ site dedicated to video essays about film form and styles. Film Krant, a Dutch site that runs some video essays. 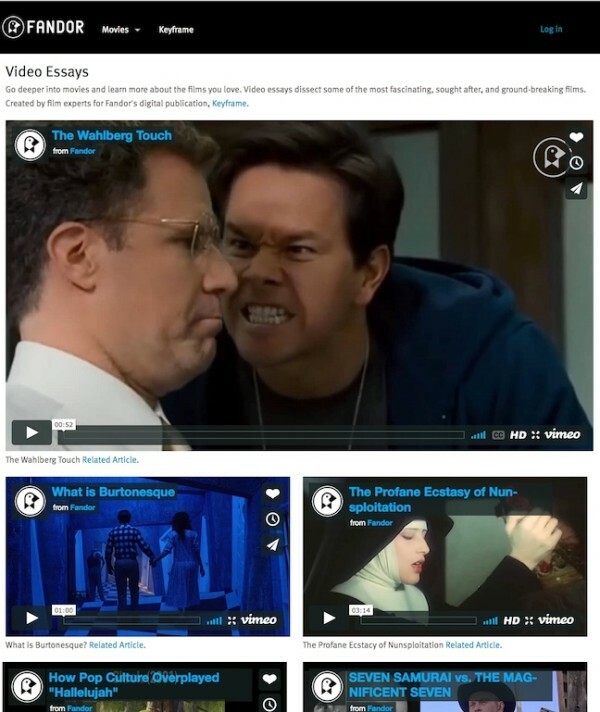 Filmanalytical, Catherine Grant’s blog dedicated to video-essay research. FilmScalpel contends that while discussing movies using words “has distinct advantages (we can use an arsenal of time-tried rhetorical devices to make our point, and rely on language’s familiar patterns to structure our reasoning),” the video essay can do better. 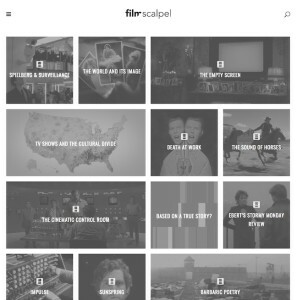 Its Filmscalpel Presents is a curated selection of video essays. Film Studies For Free, Catherine Grant’s web-archive of examples of, links to, and comment on, online, Open Access, film and moving-image studies resources. 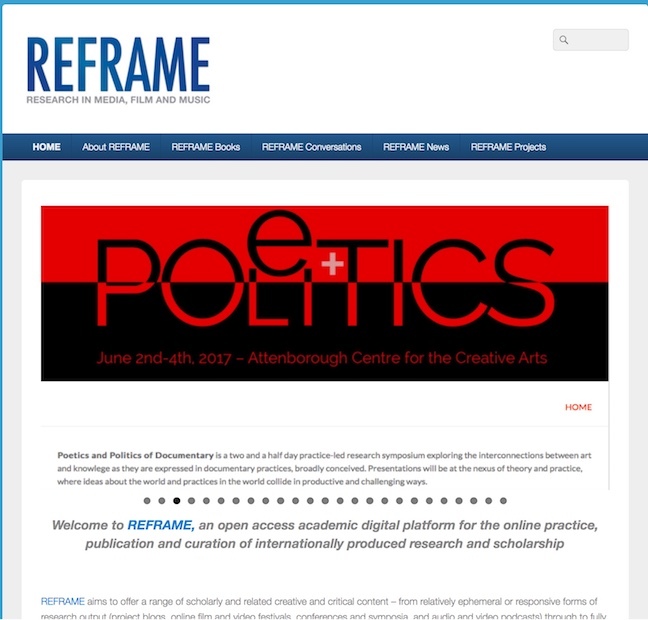 In Media Res, a site that demonstrates that the videographic essay is emerging in the midst of a ferment of new approaches to online scholarship, and online media experimentation. IndieWire has many posts about video essays, discoverable by search. 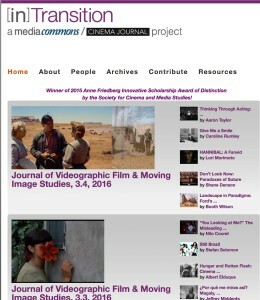 [in]Transition, the first peer-reviewed journal of videographic film studies. 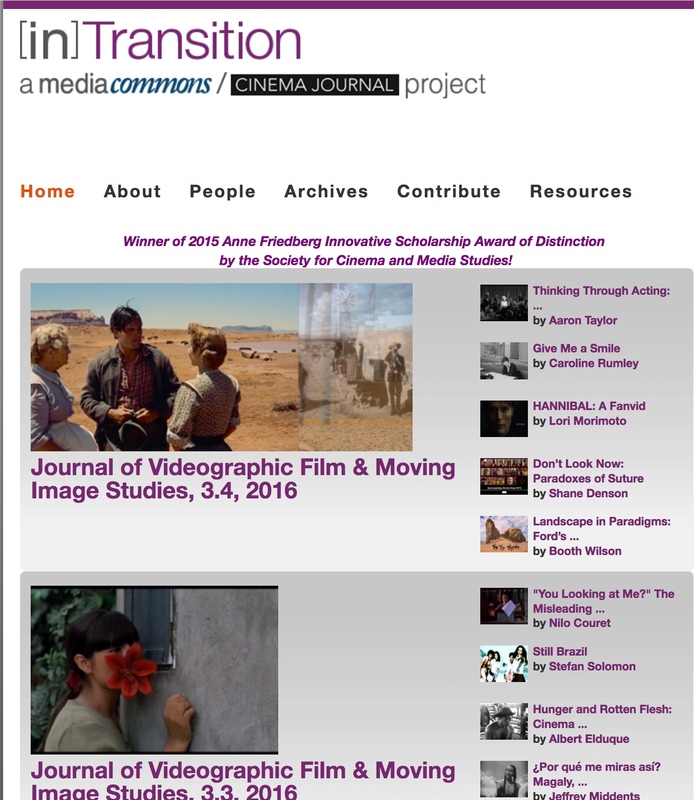 The Journal of Videographic Film and Moving Image Studies. A collaboration between MediaCommons and the Society for Cinema and Media Studies’ official publication, CINEMA JOURNAL. Keyframe, Fandor’s art-film site’s digital publication for video essays and other forms of comment. It has extensive resources, recommended readings, etc. Museum of the Moving Image has many posts about video essays, discoverable by search. 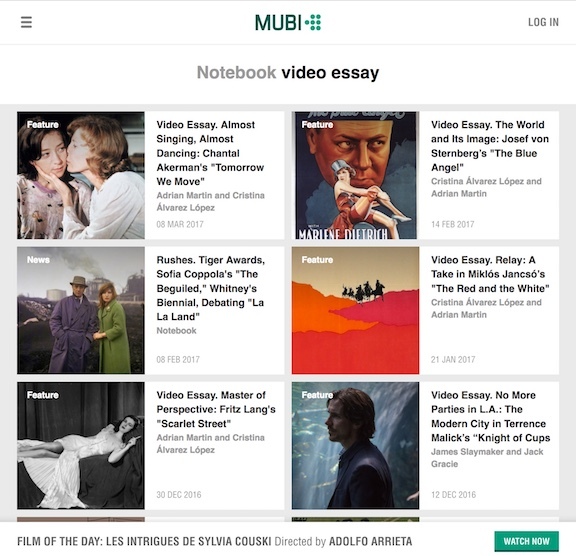 Notebook, a publication of the online independent-film presenter Mubi, has a site dedicated to video essays. 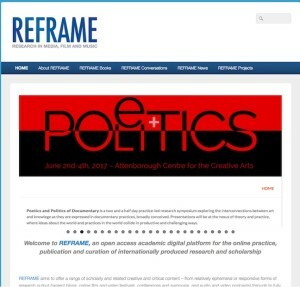 REFRAME, an open-access academic digital platform for the online practice, publication, and curation of videographic research and scholarship in media, film, and music; has a section dedicated to the audiovisual essay. It also has a section of links to articles about the emerging form and a page of resources for teachers. RogerEbert.com, the film critic’s site, has video essays (search “essay”).